The Three Shades It is both a privilege and pleasure to see Rodin's craft up close and observe the nuances of his creations,en plein air, at the Cantor Arts Center in Stanford. Seen from behind, The Three Shades are a picture of powerful musculature. These three pieces are one and the same but turned at different angles. Up close, you can see the curvatures and indentations, feel the strength emanating from the composition and enjoy the play of light on the surface. Rodin's contemporaries were the Impressionists and his works are as much about the effect of light on the object or subject as they were with Monet and his generation. 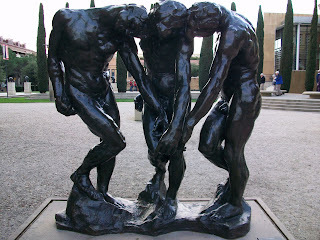 And since many of Rodin's works are displayed outdoors, light is a defining factor in his ouevres. Notice the contrast of light and dark on the faces of these two Shades and how light intensifies the facial expression. And here are their hands, as expressive as their physique, like the fingers of Michaelangelo's David in the Sistine Chapel.